I love being able to keep up with the guys when going four wheeling, and proving a girl can do anything that they can do. There is nothing more fun than being out in the dunes and being able to go anywhere. I've even had mine airborne. A Jeep was my first vehicle and I've had two more since. I know they aren't the fastest rigs out there, but I have never turned down a race. Jeeps are tough, easy to work on, and I love being able to park on the sidewalk, drive over my friends' lawns and drive over barriers in parking lots, just because I can. I first got the love of four wheeling from my dad, and have the best memories of Jeeping with him before he became disabled from battling cancer. He is a survivor, tough just like his Jeep was and someday soon when he is able, I'm going to buy him another one and we will both be out tearing up the sand again! Larry's Comment: Jennifer...first let me wish your dad a full recovery so that you both can enjoy Jeeping together. Secondly, I have to ask...do you still have friends after driving across their lawns? If so, they must be really good friends...ha! Well, tell your father that he has a Jeep to drive, so he'll recover fast. 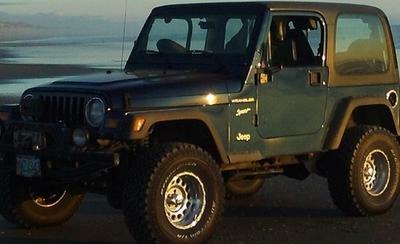 By the way, I bought my first Jeep when retired, it was my dream and I did it. It reminds me the old GMC truck I was driving 45 years ago...so, don't offer an old Jeep to your father, choose a full automatic one! Join in and write your own page! It's easy to do. How? Simply click here to return to Jeep Girl Reviews.